Located in the Spa Tower, our oversized accommodations accentuate their seaside surroundings. 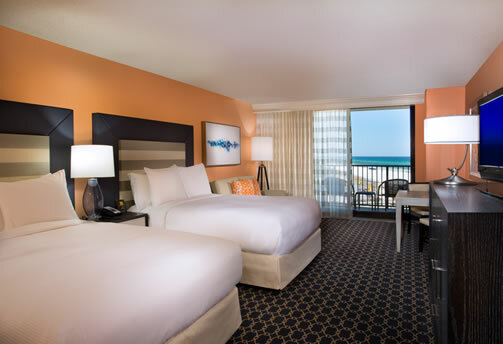 The walls are a soft peach complimenting the dark wood furniture and everything from the linens, carpeting and walls, to the local artwork evoke the inspiration of Gulf of Mexico. 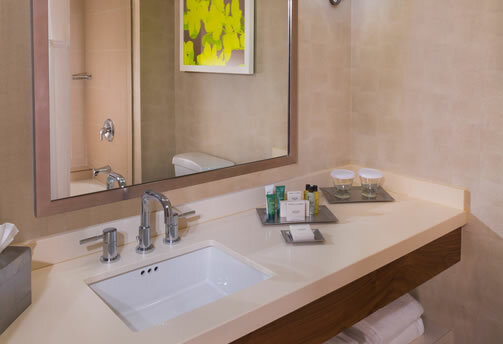 The elegant bathrooms are appointed with shades of sand, pops of bright yellow, dark wood, modern silver fixtures and clean lines. Luxurious bath and beauty products are beautifully arranged on the sleek marble countertops. 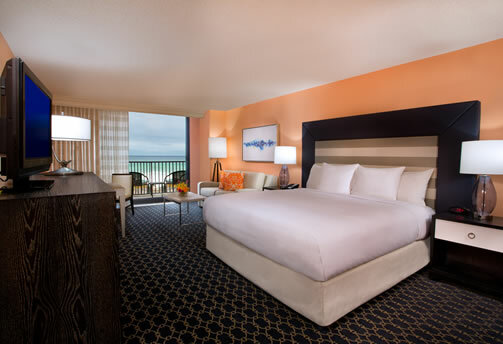 Guest rooms feature either one king bed or two double beds and each room includes a private balcony with a gorgeous view of the Gulf’s emerald green waters and sugar white sand beach. From the minute you step over the threshold into these bright, sunny and airy rooms, you will feel like you have arrived at the beach!